This is the second Frances Itani book I’ve read this year. Set in Deseronto, Ontario just after the First World War, Tell takes us into the lives of side characters from Deafening . Maggie and Am, (Grania’s aunt and uncle) and Tress and Kenan (Grania’s older sister and her war-damaged husband) take centre-stage in this novel. Two couples, both unmoored, are forced apart by different types of horror and helplessness: the horror of the First World War and catastrophic injury; the helplessness of watching your two children die horrible, slow deaths from diphtheria, isolated from medical help on the farm in the pit of a Canadian winter. 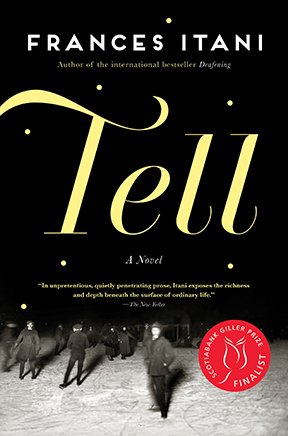 Tell is a novel of loss. It’s about our secret selves — the parts of ourselves we keep hidden from our spouse — that one person who is supposed to understand, and to love us, regardless; that person to whom we’re supposed to be able to “say the secret, dangerous words that are in our heads.” It’s about the relentless silences, shame, and grief that eat away at us over the years. The pain eventually gnaws its way out — leaving a messy, bloody hole that can only then begin to heal. But pain was pain. One person’s and the next person’s and the next. One kind of pain was no more weighty than another, surely. Where the pain took place, the map of it, made not a speck of difference. This is a book worthy of a re-read, and worth your time.